Staying active in retirement is recognized by experts as a key component of healthy living for older adults. In fact, it’s one of the most important reasons that communities for adults 55 and older have become so popular in recent years. In Central Florida, these types of planned active retirement communities make the most of the many fishing, boating, and sightseeing opportunities that are within an easy driving distance. Typically, these communities also feature resort-style amenities that make it convenient to stay active and socially connected to friends and neighbors. However, you’re not alone if you worry that your retirement nest egg won’t allow you to enjoy the kind of active retirement lifestyle you’ve been dreaming of. Although there are plenty of things to do inside the gates of Lake Griffin Harbor, our location also offers an abundance of day trip opportunities that include world-renowned theme parks, professional and college sports venues, historic sites, and more. 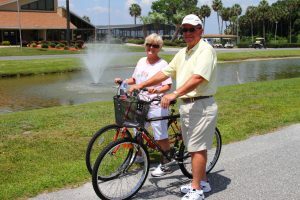 To learn more about all the ways Lake Griffin Harbor makes an active retirement lifestyle affordable, even in a coveted location like Central Florida, contact us today. Our Lifestyle Team will be happy to arrange a tour for you at your convenience.